IRETON, Ia. 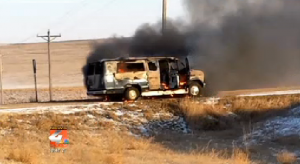 — A daycare owner in Iowa is praising God after successfully rescuing from her van the seven children that she was watching minutes before it was engulfed in flames. Tara Dekkers, 36, runs a daycare at her home in Ireton, and on Friday, she loaded the seven children that she was watching into her 15-passenger van as she needed to pick up her own children from school. However, on the way to school, Dekkers heard a “pop” and could smell smoke inside the vehicle. She pulled over and decided to remove all the children from the van. As she exited the van, she noticed that the situation was extremely serious. As some of the children were having difficulty unbuckling their seat belts, she helped them out and instructed them to run toward the ditch. An unidentified man, who is simply being recognized as a Good Samaritan, saw the vehicle in flames and pulled over to help. He placed the children in his truck so that they could stay safe and warm. “One at a time, I would untie them and get them out of the van and hand them off to the guy and he would run them to the truck,” Dekkers explained. Moments after Dekkers rescued all the children from the van, it became completely engulfed in flames. The parents of the children are now commending Dekkers for acting fast to save their children’s lives. But Dekkers is giving the credit to God for giving her the wisdom and strength to the handle the frightening ordeal. Investigators have concluded that a mechanical failure was the cause of the fire.